Cancellation Watch: Star Wars The Clone Wars CANCELLED!!! Sorry, couldn’t resist that search engine baiting headline, and the fact is that Cartoon Network’s Star Wars: The Clone Wars will come to an end after its five season run. And all across the internet there’s plenty of other headlines just like the one above that are announcing the “cancellation” of the show. But the truth of the matter is, with the Star Wars franchise sale to Disney and all, this is just a symptom of the current change in direction and potential shift of focus away from the prequel era. 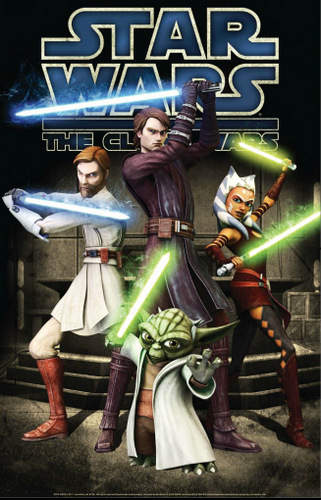 Lucasfilm has said that they “feel the time has come to wind down the series” and that they have “decided to pursue a new direction in animated programing,” and I don’t know how much further beyond five seasons they planned on taking this animated series to begin with. George Lucas originally claimed that he had at least a hundred episodes worth of material for the series, and it’s actually reached a little beyond that point with its fifth season finale (108 eps total). I stopped watching the show several seasons ago, so I don’t know how much of a conclusion the last episode provided, and if it left some threads hanging I’m sure they will be resolved at some point (the cost of a final TV movie to wrap up all the storylines is just a drop in the bucket for Lucasfilm/Dismey). But any future Star Wars television projects will likely move over to one of the Disney channels, and there is something on the horizon as Lucasfilm has announced plans of “exploring a whole new Star Wars series set in a time period previously untouched in Star Wars films or TV programming.” This news may not please Clone Wars fans too much, but fans of the franchise in general should look forward to this new direction. One unfortunate additional casualty of this new direction is the planned Star Wars Detours animated parody series from Robot Chicken creators Seth Green and Matthew Senreich. That one has not been completely scrapped, but its future is currently in limbo. As far as the most current ratings, The Walking Dead is still kicking the butts of both the cable and broadcast networks. You may be hearing plenty of spin about how History Channel’s The Bible is the most watched show and how The Vikings are plundering the ratings, but it’s the zombies who are really on top. That show pulled a 5.7 rating again in the 18-49 demographic with its most recent episode and 11.5 million total viewers. That beat The Bible‘s 2.5 rating with 10.8 million total viewers and the 1.3 score and 4.6 million total viewers for The Vikings. In fact, The Talking Dead–the post TWD show that discusses the most recent episode and the series in general–beat the latter with a 1.8 rating. On the broadcast networks, Once Upon A Time slightly improved its numbers on Sunday edging up to a 2.3 rating with 7.6 million total viewers. And on Monday, FOX’s The Following slipped a tick to a 2.7 rating with 8.2 million total viewers, though it was the top rated scripted show for the evening. On Syfy’s “Powerful Mondays” (not so much), Being Human pulled a 0.4 rating in the 18-49 demo again with 1.1 million total viewers. Lost Girl had almost the exact same scores but Continuum did not make it into the Cable Top 100. One additional note of interest: FOX has announced the season finale date for struggling Friday night series Touch. That show will wrap up its current season on May 10th indicating that they will apparently let it air out its episodes despite pulling poor ratings during its sophomore year. But short of a miraculous ratings turnaround in the upcoming weeks (unlikely), that one will almost certainly not be returning for any future seasons.